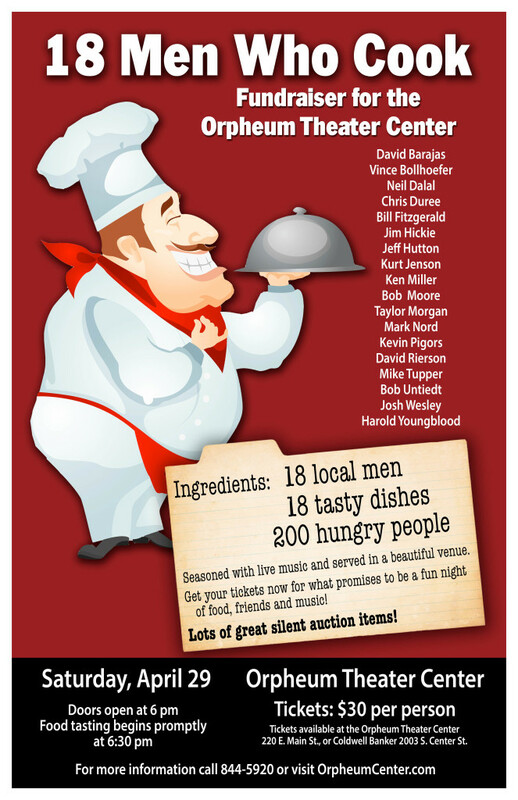 Eighteen local men will be flexing their culinary muscles for a good cause this month. The first-ever “18 Men Who Cook” fundraiser for the Orpheum Theater Center is scheduled for Saturday, April 29, at the Orpheum, 220 E. Main St. in Marshalltown. The doors will open at 6 pm, and serving will begin promptly at 6:30. A limit of 200 tickets are being sold in advance for $30 each; tickets can be purchased “first come, first served” at the Orpheum Theater Center or Coldwell Banker, 2003 S. Center Street. The 200 participants will sample 18 different dishes prepared by each chef, accompanied by wine and non-alcoholic beverages. Live background music will be provided by Moon Chaplin Eich and John Eich. The celebrity chefs include David Barajas, Vince Bollhoefer, Neil Dalal, Chris Duree, Bill Fitzgerald, Jim Hickie, Jeff Hutton, Kurt Jenson, Ken Miller, Bob Moore, Taylor Morgan, Mark Nord, Kevin Pigors, David Rierson, Mike Tupper, Bob Untiedt, Josh Wesley and Harold Youngblood. Not all the chefs have declared what they plan to prepare, but a few of the items to be served include Lasagna, JBS Rockin’ Ribs, Smoked Alaskan Salmon, Mediterranean Baklava, Tomato Basil Soup, Smoked Jerk Chicken & Citrus Slaw Sliders, Kale & Brussel Sprouts Salad, Morgan’s Spicy Ale Chili, Pav Bhaji, Canelitas de Guanajuato, Buckeyes, Caprese Salad, Jeavenly Jalapenos, Orange & Radish Salad with Pistachios, and Homemade Chicken and Noodles. In addition to the food and music, the event will include a silent auction with more than 70 single and packaged items (valued at more than $5,000) up for bid. Among the auction items are a 7-day stay at a condominium on Amelia Island, FL; a Best recliner from McGregor’s Furniture; artwork; massages; Iowa Cubs tickets; and multiple restaurant and gift certificates. The Orpheum this Fall: Learn & Enjoy!